I have recently had surgery on my lower right leg following the transverse fracture of the tibia and fibula a few months ago, so I haven’t posted for a while. The surgery, in which osteotomies were performed on the tibia and fibula to re-align the bones and re-distribute the weight along with having the tibia internally fixated with a locking plate and screws, was quite successful thankfully (x-rays to come if I can get my hands on one, quite looking forward to seeing the new hardware for the first time!). It also gave me some more time to ruminate on the meaning of this blog: of the blog’s form, function and interactivity. The basic thinking behind the site remains, as per my established aim, for it to become a repository for both my own continual learning and to provide a place for a wide audience to learn about human osteology, specifically the role human osteology plays within archaeology. 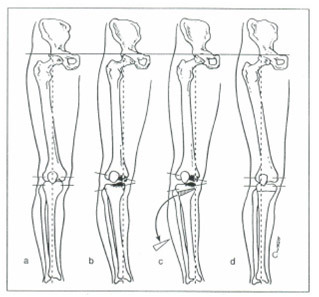 An example of a high tibial osteotomy near the knee to improve the angle of weigh-bearing and biomechanical properties of the leg: where (a) represents the presenting angle, (b) the surgery to access the joint and (C) highlights the wedge of bone removed in the osteotomy procedure and finally (d) the corrected angle post-surgery. In my case the distal tibia and fibula were surgically fractured and osteotomies carried out on the medial aspect of both bones to improve the biomechanical loading of the lower limb with internal fixation applied to improve strength (Source: SOTRS). Firstly, the development of the Skeletal Series to introduce the individual aspects of a human skeletal to a general audience. This is ongoing and has proved relatively successful I think, with some lovely feedback from both members of the academic and public spheres. Secondly, the ongoing Guest Posts in which various organisations and individuals have agreed to write an informed blog entry on their specific area of knowledge or interest. This has been a particularly fruitful approach in widening the topics of discussion on this blog. This has also led to the development of the first interview on the site, of which I am particularly happy as it has allowed the elucidation of a new methodology in a clear and straightforward manner. I am hoping that these interviews will become a much a feature of the blog as the guest posts have, and it is something I shall try to develop on the site. Thirdly, general posts by myself on a wide variety of topics that perk my interest. Within this I have included posts on specific articles, brief book reviews and personal posts. The personal posts often discuss the effects of a bone disease little mentioned in the public sphere helping I hope, in a small part, to raise the profile of McCune Albright Syndrome. As a person with McCune Albright Syndrome, and its component bone disease Fibrous Dysplasia, I have found little online in the form of information from other individual’s with the same syndrome, as such I hope my efforts in describing what I have been through, and what I continue to go through, remains useful in providing information on the syndrome and in providing a personal perspective. Further to this the site also has numerous links to many resources including links dedicated to researchers, journals and other blogs. These links are located in the categories side bar (referring to categories discussed in my blog posts), and the blog roll (links to external sites) which can be found underneath the body of the posts. I hope these provide further in-depth information for the dedicated learner and explorer. Whilst I am deeply happy that this ‘three-pronged’ approach has developed organically, I cannot help but think of the future of the blog. I do not post as often as a should, nor as often as I want, but I post because I want to, the pressure to actually post being purely self-contained so to speak. As such there may be periods where this blog is silent, but that does not mean that it has ceased to function. Indeed I often wonder how many hours of work have actually gone into producing this blog, as it can be quite time intensive to source, write and produce the blog posts themselves. There are remarkably few dedicated and consistently updated bioarchaeology/human osteology related blogs on the internet (there is a whole delicious raft of archaeology blogs however) and, whilst my site is certainly one of them, the other two are fairly well-known and well-regarded blogs. Kristina Killgrove, the bioarchaeologist behind Powered By Osteons, has stated that she sees her site as an open lab book where her own research is presented in detail to the public. Her site is regularly features posts on popular presentations of human osteology in the public domain, as well as updates on themes and articles in bioarchaeology (particularly Roman bioarchaeology). Katy Meyers, a doctoral researcher who blogs at Bones Don’t Lie, regularly writes about the main topics in bioarchaeology including posts on mortuary approaches and reviews of academic articles (articles often not available to the public). In sum Katy’s blog helpfully introduces a wide audience to the many facets of what it is bioarchaeologists actually study and why. Katy is also arguing that her site should be taken and perceived ‘as a scholarly publication’, which would be recognised and credited as a function of her research, in particular as a dedicated source and evidence of her public engagement. Having mulled over many a thought in relation to open access, public outreach and viewing blogs as scholarly publications, I have thought and developed several ideas in my relation to my own creation. Could I argue that this site is a scholarly publication? Whilst I try hard to reference scientific articles as and when possible, particularly open access articles, I am overtly aware that my site is purely written, edited and overseen by me alone. There is no peer review process, no-one looking over my shoulder for factual mistakes, scientific faux-pas or grammar mishaps. A blog is a fluid, dynamic interface which, by its very nature, can be changed, edited or deleted in an instant. They are, essentially ephemeral in tone, having no physical basis in reality (the average blog lasts for just 3 years). Not that this last point mitigates the content of a blog just it’s possible permanence. As highlighted in a previous entry there are plenty of scrupulous ‘journals’ out there, willing to discredit real research and plagiarise hard-working researchers, but there are also blogs which are peer-reviewed and monitored for content. A key counterpoint is to remember that blogs can have a real immediate impact on an audience’s understanding of a topic. The nature of a blog is that it is fast fast fast: posts can be produced rapidly and posted online extremely quickly, reaching an international audience within minutes. This is their inherent value, that research that has been carried out can be produced rapidly to an interested or already developed audience, as well as reaching new people continually. On a personal level I am astounded and honoured to be mentioned in a few academic articles as a resource for human osteology/bioarchaeology online and for the value of the content of this blog (see previous posts). It is, of course, wonderful to be acknowledged and recognised in such a way, particularly by your peers and established academic researchers. I try to edit older posts for content and spelling/grammar mistakes, update posts detailing ongoing research programs or news items and new scientific methods or evidence (I often cringe when re-reading the earlier blog entries!)*. Of course I also maintain control over what is exhibited and shown on the site itself. Friends have suggested that I move the site and place advertisements to gain a small stream of revenue from the internet traffic. I have always resisted this line of thought as I want the blog to be educational and free, without any pressure to buy a book or click on adverts. Wordpress, necessarily, add a single advert into posts when they are viewed alone but these are largely unobtrusive to the reader. My view may change in the future, if I decide to host the site myself or pay WordPress to upgrade the site, but ethically it does not bode well for me to place adverts over a site such as this, especially if I am espousing the spread of free education. On a personal level this blog is my main interaction with academia now that I have finished my Masters degree, as it allows me to engage with a wide and disparate international audience, to dream up collaborations, ideas and possible research projects. So far however I have not mentioned any original research on this site conducted by myself (minus my MSc thesis abstract). Although this is something I hope to change within a relatively short time, it can feel as if this blog could (and sometimes does) become an eternal feedback loop (co-incidentally there is a fantastic blog post here, by Benjamin Studebaker, that discusses echo chambers in journalism and blogs). Interactivity on the site has been mostly conducted via personal email or over Facebook, and I admit I have been slow to advertise the site itself on any other social media platform. It is only recently that I have installed the ‘social media’ advertisement buttons on the blog site itself; I have yet to make a personalised Twitter or Facebook handle for the blog (frankly this is something I am loath to do). In a way I want the site to stand alone, on its own merits as such. This may be foolhardy, especially in the sense that I want this blog to help educate a general and interested audience, but it is also perhaps just a factor in my own beliefs regarding the use of social media. So what are the future steps for this blog? The social buttons that are now an integral part of the posts, which also feature email and print buttons, are ready for the sharing. I am pretty keen that information on this site should be shared if possible. There are issues regarding the printing of separate blog entries from this site as it is likely that copyright issues, with regards to the images specifically, would be a problem (I would expect the use of Creative Commons attribution attribution share alike licence to apply for any use of the written material on this site). Is there a way around the copyright image issue? The image below highlights what the printed pages would hopefully look like in physical form. 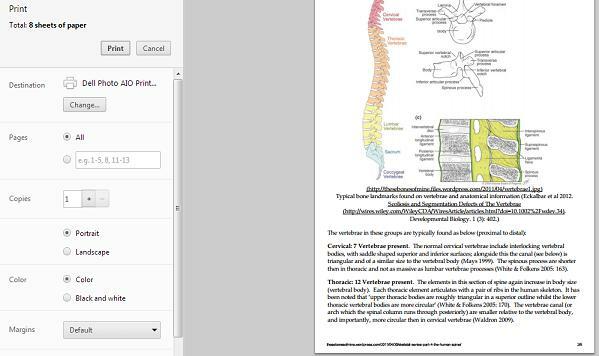 What the option to print the skeletal series looks like, with the example of the human spine entry. Note that the hyperlinks in the body of the text present as full website addresses in the text itself when printing the entries on paper. The copyright of the image would also be a problem. So what can I do to mitigate this problem? I could make the posts unavailable to print, but that would make the rest of the post inaccessible to print. I could remove the images from the posts themselves and produce my own diagrams, but at this current period in time I do not have the photographs or drawings necessary to illustrate the posts. What I have thought of is to go through each of the skeletal posts again, edit and add to them and produce a cheap ebook to sell online, a kind of basic introduction to the human skeletal system and its range of applications in human osteology. The writing would be somewhat clearer and more concise, and I have thought about the illustrations as well and where they could possibly originate from. At the moment this is a possible pipe dream, but one in which I have been ruminating on as a natural extension of the skeletal series posts when they have been completed eventually. The posts themselves will remain up and free, as this is one of the main aims of this site. I am a firm believer in giving the audience options where possible on how they should invest or use social media, so would you, as a reader of this blog, be interested in such a product? (I’ll need to do market research beforehand of course!). Returning back to the eternal feedback loop comment above, I have often wondered about the content on this blog, what to post and what not to post. Where osteological articles or news are especially well covered in the national news or respected archaeological/osteological blogs (see Richard III for example), I do not think that this blog has much more to add to the in-depth coverage already written and produced. What I hope this blog introduces is both my specialist interests and the little seen tidbits of information and useful resources. I am particularly keen on open access sources for academic articles, especially since having finished university my own access to osteological and archaeological articles is somewhat limited. I will also continue to post about tertiary education and how it is changing, as previously mentioned in articles on human osteology courses available in the UK and on MOOCs for example. As stated above this blog has developed guest posts and interviews (more to come hopefully) alongside the typical posts, and I hope to further use the medium of blogging to explore different methods of communication. Therefore there should be a photographic essay or two gracing this site within a few months, helping to show what exactly goes in archaeological departments at Universities. From there I think many topics within our bone-obsessed realm could be opened up by photo-essays; sometimes the word can only hope to capture what a picture can capture (but we’ll see how the photographs develop first!). Ultimately of course this blog is merely an expression of my passion and love for human osteology and archaeology, as such it remains a place where I document this. So these are my thoughts on where this blog has come from and where it hopes to go and to develop. We shall see what the future holds. But dear reader, what are your thoughts, what do you want to see on the blog? * I’ve edited this entry more times than I care to remember! Chapple, R. 2013. What a Long Strange Trip It’s Been! Reflections on Two Years of Blogging. Robert M. Chapple, Archaeologist. (A delightful entry on the journey of blogging for the author, an Irish archaeologist, on what it has been like and what he has done. It is certainly worth a read). As a blogger, I understand that when I write an article or new blog out, it could easily be stole or misused. However, I feel confident that the people who browse my blog merely want to learn and be informed (and entertained- I try!). As such I always try and source my information or include a bibliography on the Human Osteology entries. However, you can’t stop good ideas or patent thoughts or views. I’ll shortly be updating the Skeletal Series next entry, in the meantime enjoy the video!